This past year, I rediscovered how great an army of Astraea snails are. At Tidal Gardens, we go pretty light on cleanup crews in general. For example, there really aren’t any hermit crabs. In our 5,000 gallons of reef tanks, there may be only one or two hermit crabs. Most likely they arrived as refugees from local customers taking their tanks down and needed to re-home some of their inhabitants. I am not a fan of crabs because there is always a risk they might kill something they should not be killing, like another member of the cleanup crew or a coral. Long story short, I don’t trust them. I don’t have the same level of distrust with snails, however what tends to happen is I order a large quantity and over the years they dwindle in number and I forget all about them. A little while back, we had a system that really struggled with algae. This tends to happen towards the middle of summer, as the nutrients that build up over the winter without any problem suddenly get a whole bunch more light. That causes algae to grow if we don’t ramp up water changes heavily. This year, we didn’t do enough water changes in the summer and got some nuisance algae. At one point, a couple of the tanks looked unrecoverable. We were scrubbing the tank as well as trying to clean the individual corals for a while, but the algae was just too persistent. Once algae starts growing on the corals themselves, it is very difficult to manage. Instead of just restarting the tank, I decided to put in a bunch of Astraea snails, and the results were nothing short of miraculous. It didn’t even take a week for them to do serious work on the algae. One system that seemed like a lost cause because of the algae completely recovered. The snails did an amazing job of eating the algae around each polyp of coral, and the system now looks pristine. There are a couple things that make these guys great herbivores. First off, Astraea snails are fairly small. There are certainly larger snails you can get, like Mexican Turbos for example, but there is an advantage to snails being smaller. Smaller snails don’t bulldoze your tank and knock corals all over the place. Also, smaller snails can get into smaller crevices to clean out algae that larger snails won’t be able to get to. Proper ID can be a subject of debate, but they have often been sold as West Indian Star Shells, Astraea tecta. Second, they are surgical when it comes to cleaning. 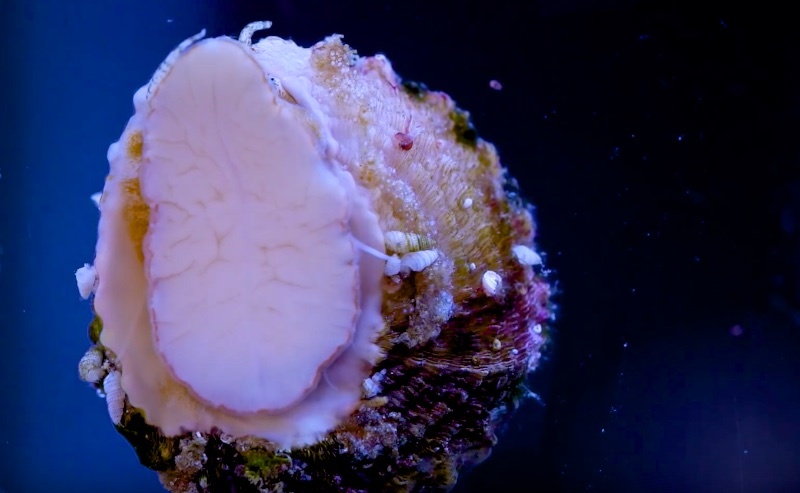 As I mentioned a moment ago, we had algae practically growing on the corals themselves, and these snails ate right up to the edge of the polyp. They literally made what looked like an unrecoverable system spotless, and that includes the corals. Third, and perhaps best of all, Astraea are cheap. You can usually find them for around a dollar a piece. No cleanup crew member is perfect, however. The main concern with Astraea snails is they struggle a little bit flipping themselves over. I don’t know how some of these snails make it in the wild, but for whatever reason, if you see one flipped on its back, don’t assume it will be fine. Give it a hand and flip it over. Note tiny white Pyramid Snails hitchhiking in on this Astraea snail. These predators can attack and kill their hosts, as well as valuable Tridacna sp. clams. Third, look to make sure the snails come from a tropical climate. The ones we have are from Florida which is great. Unfortunately, many types of snails that are sold in the hobby are harvested from cold water areas, and some of them look a lot like Astraeas. Cold water snails do not last long in our tropical aquariums. The last point is to take your time acclimating them, because snails handle the acclimation process somewhat poorly; so, if you can drip-acclimate them, that works best. Also, be sure not to subject any inverts like snails, shrimp, clams, or worms to coral pest control dips. It may seem to go without saying to not use pest control dips, but trust me, it’s been done before by many hobbyists, resulting in the quick demise of the poor inverts. In conclusion, I wanted to share my overwhelmingly positive experience with these Astraea snails. They are making a world of difference in the tanks here at Tidal Gardens. They are so easy to overlook, but these snails literally saved us the hassle of restarting a couple large systems.